Smokey, salty, and just the right amount of chewy, jerky is a classic snack out on the trail. 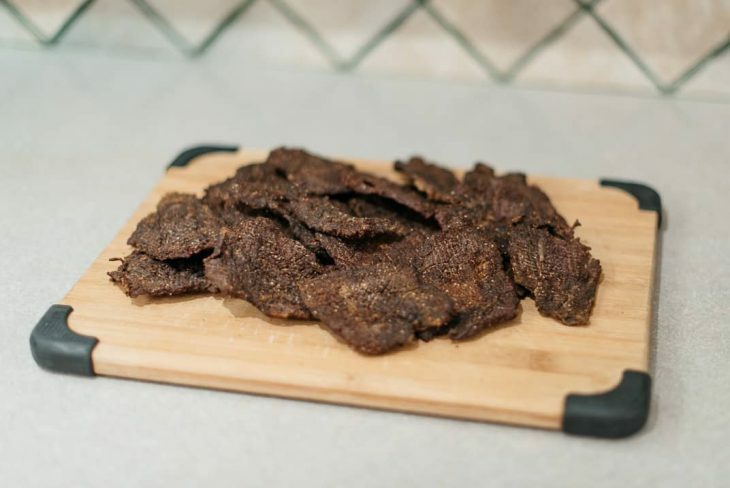 Learn how to make beef jerky with a dehydrator with this simple beef jerky recipe brought to you by contributors Kira & Brendon of Adventure Haks! When Brendon and I first starting adventuring together we were finding it difficult to eat healthy. Most of the stuff we would bring was processed or loaded with preservatives. It was this that lead us to make our own meals and snacks and how we came to making our own jerky. 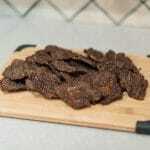 Making your own jerky not only tastes better but is also better for you and your wallet. The cuts of meat we use vary depending on what is available or what is on sale. Ideally, you want a lean cut of meat as free from fat as possible; the more fat, the shorter the storage life of your jerky. When slicing the meat, it helps if you partially freeze as this makes it easier & helps in getting thin, even pieces. You can cut any visible pieces of fat off at this time too. Cut with the grain for chewier jerky & cut against the grain for tender but more brittle pieces. 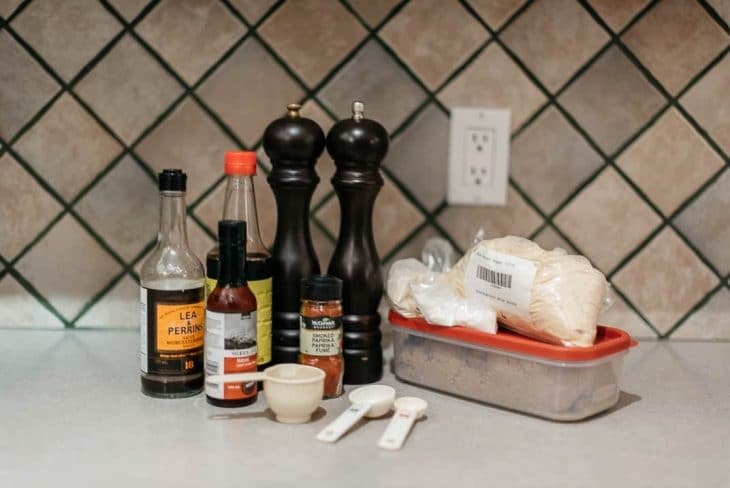 Once you have made the marinade and poured it onto the slices, put it in the fridge and let it marinate. You can leave it overnight or up to 36 hours. Rotate the strips every now and then to ensure even and thorough coating. We like to leave it as long as we can because we find it gives it the best flavour. 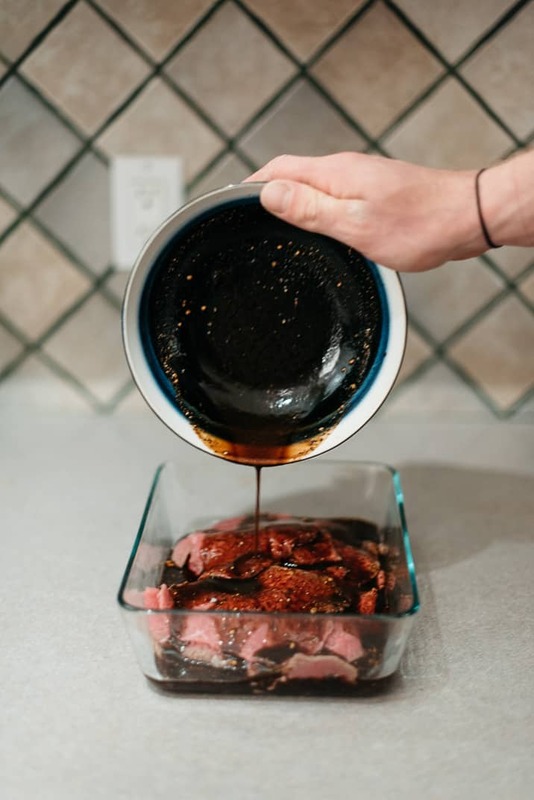 Once you are ready to dehydrate, shake off any excess marinade and spread the strips in a single layer on your dehydrator trays. The drying time can vary depending on how uniform and/or thick your slices are or on the dehydrator. We recommend checking your dehydrators manual. Properly dried jerky should crack, when bent, but not break. Be sure to test using a cooled piece. The recipe has been adapted over time from a basic recipe we had found online. Each time we would slightly alter the ingredients to suit our tastes until we got it just right. We have experimented with other jerky recipes but this is the one that we always come back to. 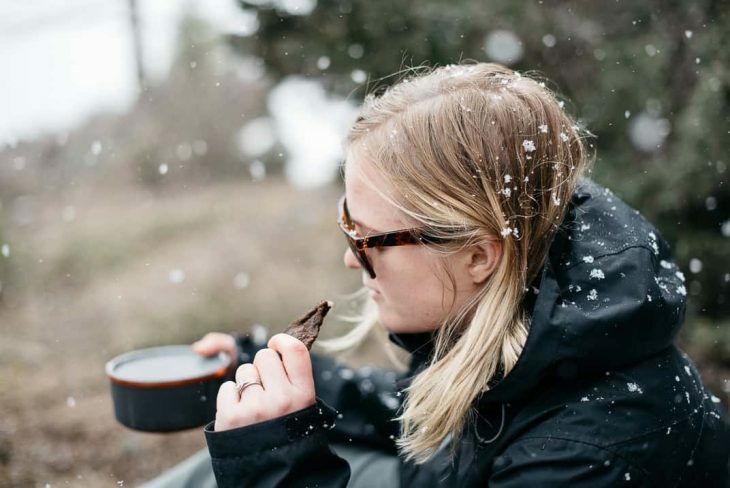 Jerky is our go-to snack for any outdoor adventure. Whether packing food for an overnight camp trip or multiple day backpacking trips we always make sure we bring some. From making jerky and fruit leathers, to drying fresh fruits and vegetables for longer term storage, or even creating dehydrated just-add-boiling-water for backpacking trips or emergencies, there are dozens of ways to use a dehydrator. As with most kitchen appliances, there are a number of options to choose from. There are two that we see over and over again. If you’re budget conscious (🙋) the Nesco Snackmaster Pro is probably your best bet. If you will be doing a lot of dehydrating, you’ll likely be able to recoup the cost of one of the Excalibur model dehydrators, which has long held the position of best-of-the-best in the dehydrating community. Thinly slice the roast. * Cut off all visible fat. 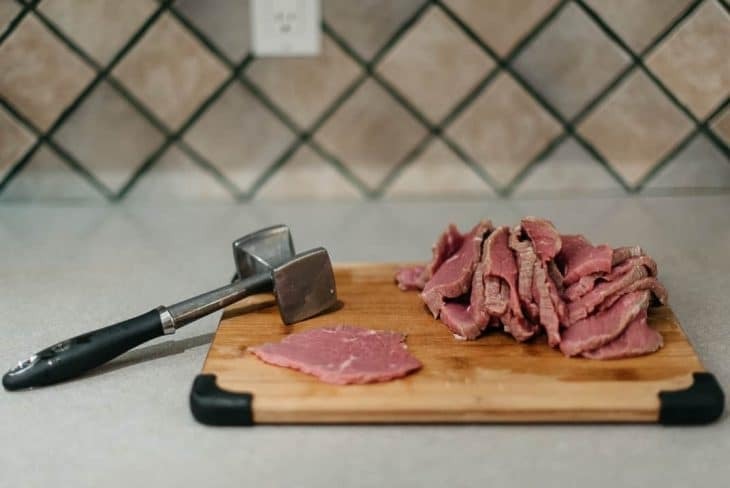 Pound slices with a meat tenderizer mallet until pieces are uniform thickness (aprox nickel width). Layer beef strips in dish. 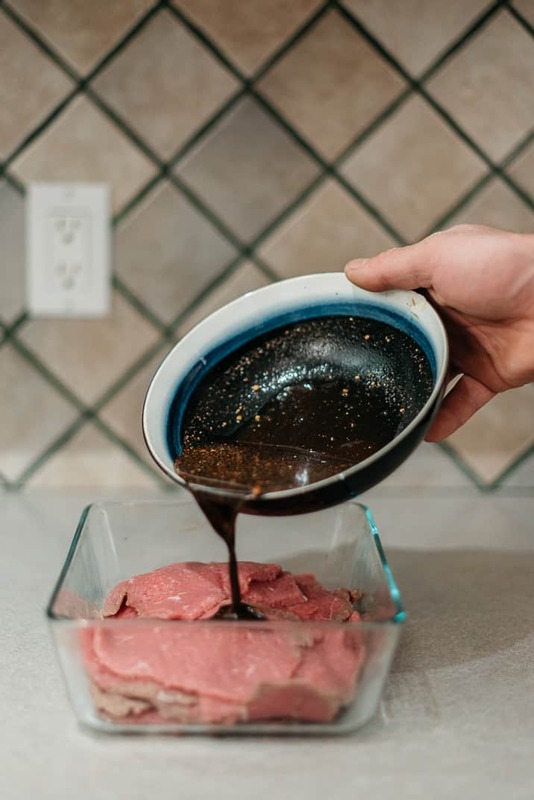 Mix remaining ingredients and pour over beef. Lift layers with fork to ensure that all beef is covered. Cover & marinate for 12-36 hours. Turn strips over several times to ensure thorough coating. Spread the meat in a single layer on the dehydrator trays. Dry at 165F/74C for 6-10 hours, occasionally blotting off any fat droplets that appear on the surface. Test using a cooled piece. Properly dried jerky, when bent, should crack but not break. Package jerky, into individual portions, in air-tight containers (like ziplock bags) or vacuum seal. Store in a cool, dark & dry place. *Partially freezing the meat makes it easier & helps in getting thin, even pieces. Cut with the grain for chewier jerky & cut against the grain for tender but more brittle pieces. Meet Brendon & Kira – The Adventure Haks. We are avid outdoor enthusiasts who enjoy any activity that will take us outside. Most of our time is spent motorcycle touring, where we can combine the freedom to explore new places with our love for hiking, fishing, and camping. We are currently living & adventuring in British Columbia, Canada. Dr. Pepper. Instead of the jalapenos he used red pepper seeds. My hope is that your recipe is similar. Thanks again for sharing! My hubby borrowed this round dehydrator yrs ago from a friend that pasted. It’s in the shed. I am disabled n was thinking of making jerky n selling to bars, small stores ect but can I make money on it.n sell for how much. Not sure what kind it is. Thank you for any help. Use toothpicks soaked in cooking oil. It is easier to remove jerky from toothpicks than water! My dehydrator does not have a temperature gauge, is that important? I am sure there is a way around it but it is somewhat important. Different foods require different temperatures and times. I would suggest checking the jerky frequently (a cooled piece should crack and not break when it is done). If your dehydrator doesn’t get warm enough you could finish it off in the oven at a higher temperature. Dehydrator not required! I get great results with just an oven and some wooden skewers. Soak the skewers in water overnight, string meat onto said skewers, and drape through the bars of an oven grate (I recommend lining the bottom of your oven with foil). “Cook” at around 170F for ~4-5 hours, then let cool for at least 6 hours. N.B., to assist with air circulation, either set your oven to convection (if that’s an option), or wedge open the oven door a tad with a wooden spoon. Thanks for the info, Ben! Super helpful for those of us without a dehydrator. Looking forward to trying out your method before our summer road trip. Yup. I’ve been making jerky for 50 years. Until a few years ago it was all made in the oven. I used toothpicks. Turn it as low as it will go and crack the door open.